It included history written by Emma Bateman Lindstrom with photos by Dr. W. P. Johns, a physician with the GTP. The history of Bateman's Landing (1905-1948) located just west of the Zymachord River. There was a hospital located here at Bateman's Landing. He was a Prospector of great record. May 1912 he was at the Hotel Vancouver, on his way up to Fort George to look for minerals. 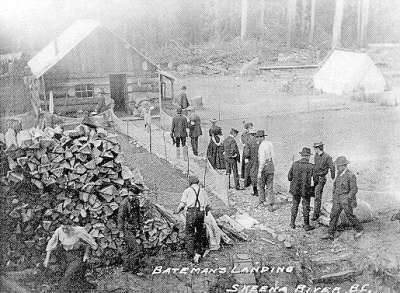 June 7, 1907 J. Batemn was on the SS Northwest heading to Kitsumgallum, where he had a contract to supply Cordwood for the boat. He was also going to stake a bunch of timber limits in the area. He is shown as an old resident of the section at that time. Charlie came from the Yukon in 1907 to work on the railroad as a blacksmith. He later was a farmer and logger. There was a W. M. Bateman in Kitselas.